With the increasing importance and responsibility of saving the planet and all its natural resources, some individuals as well as companies have been thinking out of the box and creating innovative solutions to housing problems and the impact they have on our environment once constructed. Eco friendly or green homes have come a long way in just a short time frame. From wind-powered electric turbines to solar panels and geothermal heating systems, these homes are not surprisingly becoming a favored universal trend. This current style of dwelling will not only diminishes the carbon footprint a home leaves behind but has also has influenced some to design some of the world’s most extreme eco friendly homes. Below is a list of our top ten. Athena Marie Plantation – North Hutchinson Island in Vero Beach is home to the Athena Marie Plantation. Known to be the largest green home built in the U.S. as of this date, this 45,760 square foot plantation is the first in the America to feature wind powered electric turbines on its roof. The second level has open curved balconies overlooking the main foyer with three oceanfront guest suites and a 400 square foot exercise room for Athena’s guests and their families and the master suite has ten mile views of the gorgeous Treasure Coast beaches of Florida. Even more impressive is the fact that this plantation is also the first green home design in Florida to use 100 percent renewable energy. This means it will be built with an Insulated Concrete Form wall system that will not only save energy and reduce its carbon footprint, but will also help the building withstand high winds and damage in the event of a hurricane. The Orchid House – Located on a nature reserve in Cotswold, England, the Orchid House is part of the Lower Mill Estate, a green home building project that includes the development of several eco-houses. Presently it is the most expensive green home that has ever actually been sold at a record $14.2 million U.S. dollars. Although not as big as others, at 2400 square feet, the cost works out to roughly about $6,000 per square foot. The home features cutting-edge designs and will generate more energy than it consumes through a geothermal heating underground pump. The form is created using laminated veneer lumber clad with timber shingles imprinted with a camouflage pattern. The Orchid House was inspired by and resembles a bee orchid, a flower abundantly found on the nature reserve. 570 Edgewater Drive in Tampa, Florida – Tampa is a great environment for this most extreme green home structure. This 12,000-square-foot green home features solar electric panels, an underground pump for geothermal heating, LED lighting and a specially monitored system that lets the shower water be reused for flushing the toilets. The arrangements for this green home building construction anticipate it will generate as much electricity as it utilizes. As a matter of fact, this eco friendly home combines so many green home design principles that the builder’s hopes is to receive a platinum certification, which is the highest possible level of certification available from the U.S. Green Building Coalition’s Leadership in Energy and Environmental Design (LEED). 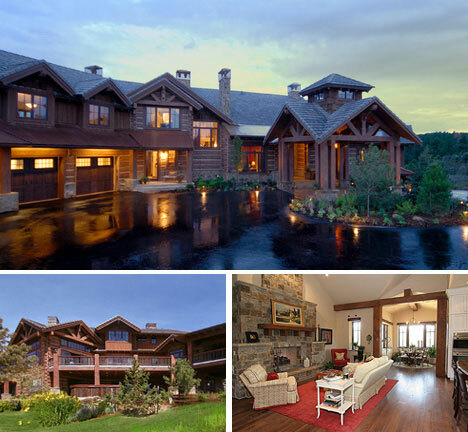 995 Longbow Place in Larkspur, Colorado – This 9,800 square foot home is known as “one of the greenest luxury homes ever built.” In spite of the enormous size, the utility bill costs a meager $350 per month. The spacious $4.5 million green home is full of eco friendly attributes like solar thermal panels, 90 percent efficient water heating systems, solar electric panels and wrap-around wall insulation. Recycled and organic materials were used throughout the home, like Volatile Organic Compound-free paints and stains and logs made of composite materials for the outside finish. Portable Martin House-To-Go – Frankly, this has to be one of the most practical, eco friendly houses on the planet. It definite takes the term green to the extreme. With this portable house, you can pack up and move whenever you feel the need. The Martin portable house is constructed to the highest of building specifications and is weatherproofed with NASA accredited insulation that will endure harsh weather conditions. Although, the living quarters are small you will not be cramped. The floor plan uses the space wisely to pack as much as possible in to a small space, while giving its residents room enough to breath. It comes complete with a kitchen with sink, refrigerator and stove, a bathroom with shower, sink and toilet, and a roomy loft bedroom. It also has bamboo floors, cathedral ceilings and large windows to create a more open environment. The $33,900 price tag makes the Martin House-to-Go an affordable housing alternative to some of the other houses listed. This would be great for anyone wanting to reduce the high housing costs of traditional living choices. Ewok Tree House – This Ewok style tree house was designed by Tom Chudleigh, a Canadian carpenter. The wood and fiberglass waterproof exterior protects the inside of the house which comes with a working kitchen that includes a refrigerator, sink, and microwave. There are also built in beds but unfortunately when using the bathroom you must use the great outdoors. For around $45,000 you can buy just the sphere but for another $50,000 or so you can purchase some extra accessories. The spheres are suspended in trees and accessible by a series of rope bridges. The 11ft wide eco friendly house can sleep four, allowing families to live in the forest without the need to worry about their carbon footprints. The Zerohouse – This is yet another green wave of the future in sustainable design. Besides looking pretty cool, this eco friendly home provides creative strategies combined with attractive materials, colors and finishes. The zerohouse can collects solar power and store energy for up to at least a week’s worth of usage. It also gathers rainwater in an elevated 2700 gallon reservoir so that gravity can takes it course instead of tapping into the power supply. Waste is processed into dry compost below the house and insulation and day-lighting are used to balance internal temperatures and maximize thermal performance. The house has everything needed for a weekend getaway or long term residence, including a living room, kitchen, bathroom, two bedrooms and covered deck. Everything in the house is automatic, with master controls wired to a central laptop computer. Acqua Liana In Palm Beach County, Florida, developer Frank McKinney has built the world’s largest and most expensive eco friendly home. This enormity is priced at an astronomical $29 million and is the subject of a documentary called The Green Giant. Measurements are at 15,000 square feet and its green amenities include enough solar panels to cover a NBA sized basketball court and purifying systems that produce an air quality cleaner than that of a hospital’s operating room. To reduce temperature, the home features reclaimed and renewable wood, and plenty of waterfalls, pools, and reflecting ponds. There was even a special system created to collect and recycle runoff water from the roof to give to the garden and landscape. Windermere on the Lake – The picture shown is a model home located in a community of quaint eco friendly lakeside homes’ centralized in Stamford, Connecticut . At approximately 7,000 square feet, it includes a number of optional features such as an elevator, wine cellar, home theater, exercise room, low VOC-paint, geothermal HVAC and Smart House energy controls. This would probably be considered a starter green home to some being that the other three models available range between $3.2 to $4.8 million. The Dome House – Japan Dome Housing Co., Ltd, a home manufacturer in Japan, created a surprisingly amazing energy efficient, weather durable, Styrofoam expandable igloo shaped house kit. Believe it or not, this house of the future can be brought and assembled by you and two or three of your friends in a matter of three days provided you work nonstop or in about a week taking your time. A plus to using 100% foam instead of wood or metal, is that it is rot, water, and termite proof, which automatically saves the inhabitants thousands of dollars in future maintenance costs. Using these materials designed by expert engineers provides a structure that is extremely resistant to earthquakes, hurricanes, and typhoons, which also gives peace of mind to those living in environments with frequent and reoccurring forces of nature. These homes are just some examples of the most extreme eco friendly homes. There are many upgrades that can be done that can certainly make your home more comfortable for your family and more energy efficient. Many options and green home design choices are available today, especially as the cost for sustainable products will continue to decline in the near future.